As many Lent Madness fans will know, the whole thing is run by the modestly named Supreme Executive Committee. Composed of Tim and Scott, the SEC works tirelessly throughout the year to bring you Lent Madness. But there are sometimes grave challenges between these two, as they have mutually declared the other to be an archnemesis. This archrivalry began on their two blogs, Seven whole days and Clergy Family Confidential. Anyway, because of their love of Lent Madness and you the global public, the SEC has agreed to set aside their differences for the Lenten season. Look for a (temporary) spirit of amity and cooperation. Today both Tim and Scott have posted a notice on their respective blogs. Please go visit their blogs and leave comments of encouragement or derision. You are also welcome to take sides, if you so choose. But come Lent, let us all unite behind the banner of purple in the glow of the Golden Halo. This rapprochement means Lent Madness can go on without melodrama inside the SEC. It also gives each of them about 47 days to scheme for advantage when the détente ends at the Great Vigil of Easter. 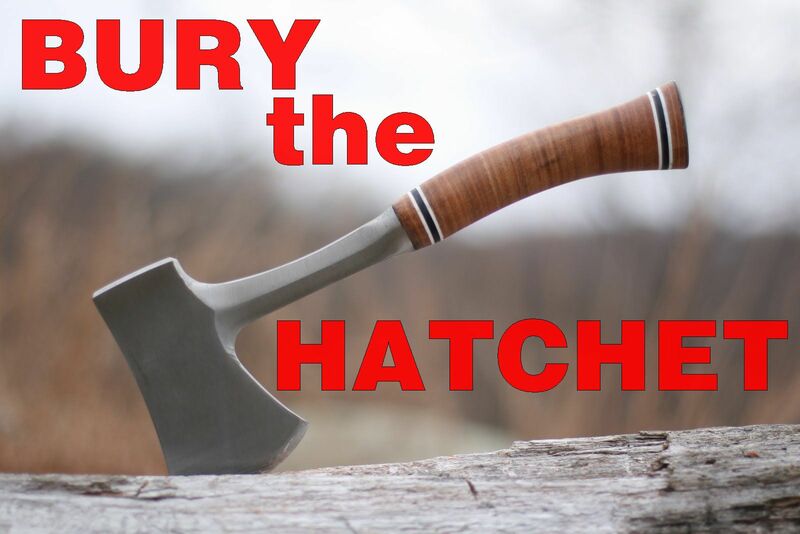 For now, as we bury the alleluia on Shrove Tuesday, the SEC is burying the hatchet of enmity. 15 Comments to "Burying the Alleluia and the Hatchet"
Relieved you’re not burying the hatchet in each other’s heads! So looking forward to this year’s Lent Madness, which I will participate in like a Lady of Leisure. 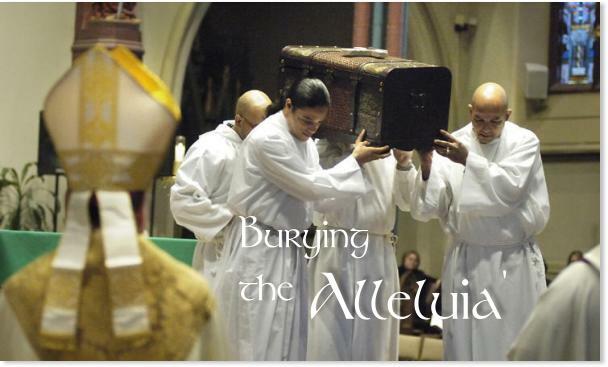 Sneaking in one last…alleluia! Or, laisser les cendres noires rouler! Does this mean that you are burying the hatchet with me as your “Canadian Nemesis”? Bracket arrived today – snow delay, but just in time! Bracket is up on the wall in the Parish House. Coffee mug sits next to the one from last year (this year the larger one was not offered as an option…Boo!) in the kitchen cabinet. All set to go!!! Confession…Just couldn’t wait. Had to try out the new mug before Ash Thursday! You guys are weird PLUS and I love it! A little friction creates the right amount of tension needed for geniuses to plot and plan and I say “Have at it!!!! !” Loving drinking out of my new LENT MADNESS 2013 cup with Mary Mags looking right at moi…a sure sign of guilt about something I’ve done or planned to do. On with it! New to this. How does one vote? Jon, welcome to Lent Madness! I just finished putting a video on the upper-right corner of the site, “Voting 101.” I think it will answer all your questions. Enjoy! What I really REALLY want to see is Frs Gunn snd Schenk at the SAME pancake supper. Pancakes ! Did someone mention pancakes ? Darn it, why oh why did I give up sweets for Lent. I want pancakes (or waffles) with lots of butter and and a Lent Madness cup of syrup. Alleluia!!! Alleluia!!! I just wanted to be able to say Alleluia!!!! All I can say is that if I ever see Tim and Scott in a Lent Madness Smack-down, I’m refusing to vote!